1. In a saucepan, melt butter and cook cranberries over medium heat. Add honey. 2. Continue cooking until cranberries are soft and honey has thickened, about 3 minutes. 3. Meanwhile, in a wide shallow dish, beat eggs with sugar, milk and vanilla. 4. Melt butter in 2 large non-stick frying pans over medium heat to coat pans. 5. Dip each slice of bread in egg mixture, several seconds per side. Bread should be well coated but not saturated. Cook immediately, 3 to 5 minutes per side, depending on thickness and desired level of doneness. 6. 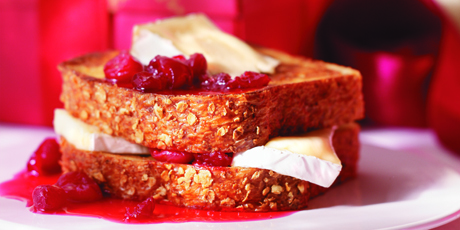 Arrange French toast on a serving plate, alternating with cheese and honey cranberries. Serve with warm honey, if desired. 7. Honey cranberries can be frozen.